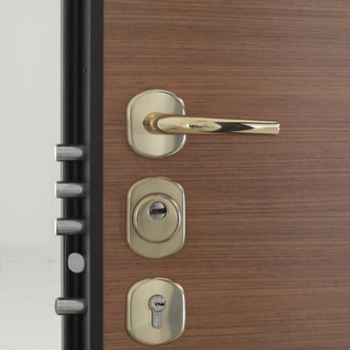 Planar multisystem lock with European cylinder with half rotation driven by cylinder and handle. Three turn strokes (3 latches, 18 mm diameter and 30 mm stroke ) plus 1 handle lacht (20 mm diameter). 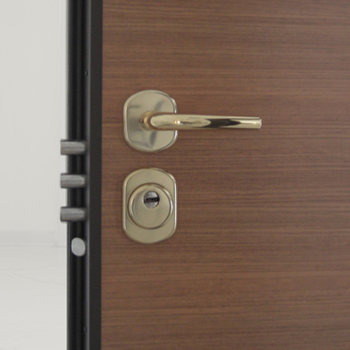 The lock is provided with a patented device for irreversible block of the latches in case of forced extraction of the cylinder with closed door; moreover there is an inner shaped lever to grant the highest resistance against the attempts of push of the latches inside the lock. All the locks are supplied with antidrill defender and cover with the same finishing of the handle set, and AGB Scudo 5000 cylinder with 5 keys plus 1 buiding site key that allows the possibility of countless and fast copies. 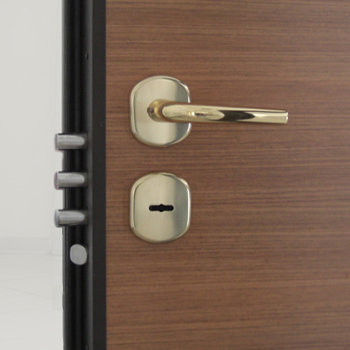 Planar system lock with double cylinder with half rotation driven by the upper cylinder, lower cylynder or by handle. Enter key and handle 63 mm from the side of the door. Three turn strokes (3 latches, center to center distance 37 mm, 18 mm diameter, 30 mm stroke) plus 1 handle lacht (20 mm diameter). Fixing of the service cylinder without head screw (for European cylinders). Predisposition for protector antidrill defender and all European profile cylinders All the locks are supplied with European cylinder with antidrill defender. It is possible to install a couple of AGB Scudo 5000 (A+B) cylynders with a cylynder for service key and B cylynder for the main key (the main key opens the service lock, but is not allowed to the service key to open the door when it is completely lock with the main key). The lower lock (B cylynder) blocks the upper lock (A cylinder). Planar double-bit. Three turn strokes (3 latches, 18 mm diameter and 40 mm stroke ) with half rotation driven by the key plus 1 handle lacht (20 mm diameter). This lock has innovative system for automatic recoding by the use of two different kind of key (the blue key – the temporary key – and the green keys – the main keys). The blue keys is different for each lock (it only opens two turn strokes and the half stroke) in order to ensure safety also in the final phase of the works. The main key (the green one) allows to recode the lock without uninstalling panels and covers and definitely excludes the blue key that will not be usable. The recoding is simply executed by the 4 complete strokes. 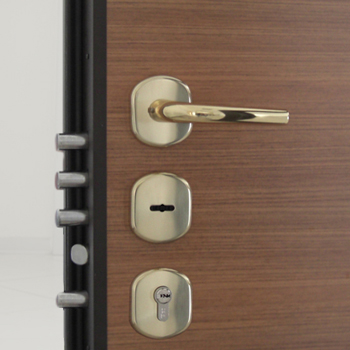 Planar multisystem lock with double-bit and service lock with half rotation driven by the key, the handle and cylinder. Half rotation and double stroke driven by lower cylinder, that blocks the upper lock (service key). Three turn strokes (3 latches, center to center distance 37 mm, 18 mm diameter, 40 mm stroke ) plus 1 handle lacht (20 mm diameter). Lower latch with European cylinder, 2 turn and 20 mm strokes.